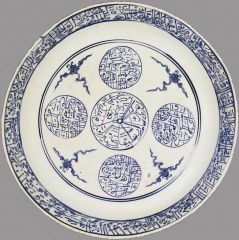 Large white porcelain dish with cobalt blue glaze decorated with a central inscribed roundel surrounded by four evenly spaced roundels each filled with an identical inscription. The interior of the foot is a Hongzhi six-character mark withing a a double line roundel. In the central roundel: "Bestow numerous blessings and great honour upon him for You are the Most Merciful of those who show mercy." 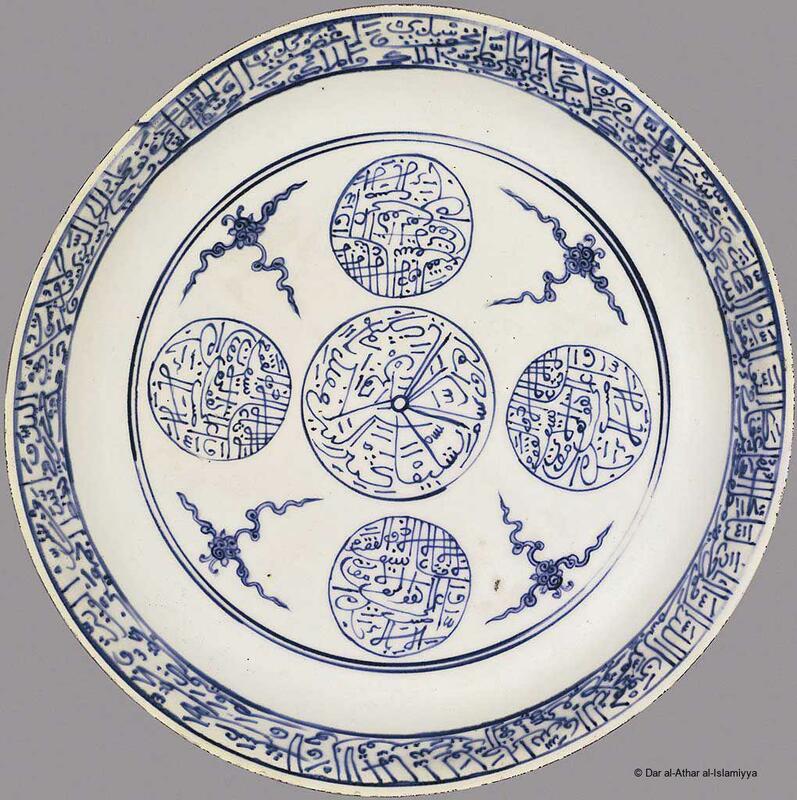 In the surrounding roundels, a repetition of: "There is no youth other than `Ali There is no sword other than Zulficar And `Ali is the Rightful Death will only strike at the appointed time." Around the rim: "In the name of God the Compassionate, the Merciful Call unto `Ali the paragon of wonders, you shall find him of help in your misfortune. He who is relied upon [to intercede] before God for all needs All anguish and all sorrow shall disappear, through your Prophethood Oh Muhammad and through your Divine trusteeship, Oh `Ali, Oh `Ali, Oh `Ali By the Divine Truth of The Absolute Sovereign of all things I take refuge in He Who has the glory, the might and the power And we put our trust in He Who slumbers and perishes not I take refuge in God's sanctuary, and in His protection from the evil of all beings By the truth of "ham", by the truth of "kahi`us" and "`asaq" There is neither power nor strength but in God, The Most High, The Supreme May the blessing of God be upon Muhammad Mustafa (the Chosen) and his family collectively."